If you are on the market for a luxury vehicle, there is no smarter choice to make than to buy a pre-owned. Because you can still get all of the luxury features that you want, at a significantly lower price point than you would get for a new vehicle, it is easily the most economical choice to make. Because we want to help you with the research portion of finding your next pre-owned luxury vehicle, we here at Certified Autoplex highlight various vehicles we have available in our inventory. Here, we will be providing details on the Cadillac SRX crossover. Cadillac has consistently been one of the most prestigious luxury car brands for decades, and for good reason. The SRX in particular of what exactly makes Cadillac so great. On top of its impressive engine power and size, it has a ton of great luxury features that drivers and passengers alike are sure to love. Let's take a closer look at some of the features and specifications that make up the Cadillac SRX. If you are in the Dallas TX area and are considering a used Cadillac SRX, you can follow this link to our inventory. We currently have one available model of the Cadillac SRX, which is from the 2016 model year. This luxury crossover has a ton to offer drivers, from luxury features, to performance capabilities, comfort and more. Let's take a closer look at some of these features. In terms of vehicle performance, the Cadillac SRX definitely has a lot to love under the hood. The 3.6L V6 engine generates up to a whopping 308 horsepower and 265 lb-ft of torque, which gives it a ton of power. Additionally, features like a Tiptronic automatic transmission, electronic stability system, brake assist and more give it the handling to put the driver in full control of the vehicle at all times. In terms of safety features, the Cadillac SRX has a lot to offer, both mechanically and technologically, that will give you and your passengers peace of mind out on the road. Mechanical safety features include six standard airbags, traction control, tire-pressure monitoring and more. Technological safety features include blind spot monitoring, lane-departure warning, forward collision warning and more. Finally, what kind of luxury vehicle would the Cadillac SRX be if it did not have a ton of great luxury features to offer? Luckily, the SRX has features like dual-zone automatic temperature control, adaptive cruise control, USB ports, a 10-speaker audio system with an amplifier, a touchscreen display and more. 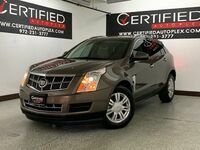 Interested in a Cadillac SRX?